Freedom to discriminate with impunity? It's worse than that. Almost universally, the religious freedom claims pursued in the U.S. over the last two decades seek the freedom to do harm, most often the freedom to harm queers, women, children or religious outsiders, or America's secular government institutions. Ironically, one reason that modern religious freedom claims so often seek the right to do harm is that other kinds of religious belief and practice are so well established. For over 200 years, core religious freedoms have been protected by law in the United States. America’s founders carefully secured the right of men to believe, think, and assemble for worship as they chose—or to publicly deny that they belonged to the religious majority without being excluded from the power and privilege of public office. 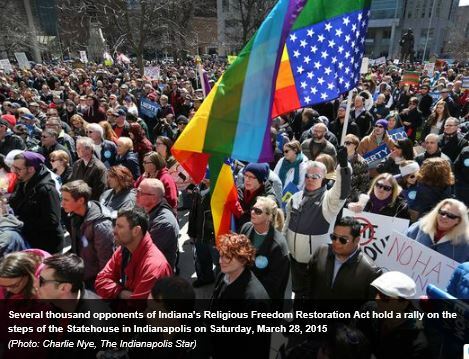 Much has been made of the fact that Indiana’s Religious Freedom Restoration Act pushes beyond the bounds set by the federal law of the same name. It explicitly grants religious personhood to for-profit businesses. In addition, immunity for religiously motivated behavior applies to disputes between private individuals in which the government has no part. Outside of a narrow "fix" implemented to ease public criticism, this combination should make it difficult for individuals that are harmed by discrimination or denial of care or other religious intrusions to obtain redress in civil court. Yes, these laws do condone bigotry, and misogyny, and other ugly prejudices. But, the photo of those present at the signing of Indiana’s bill--its major proponents—is telling. It mixes white male politicians in suits with a proud array of nuns in habits, monks in cassocks and orthodox Jew in a top hat. Like many of those advocating segregation during the Civil Rights Movement, the advocates of this bill were motivated by devout religious beliefs. Ironically, one reason that modern religious freedom claims so often seek the right to do harm is that other kinds of religious belief and practice are so well established.Christianity, on the other hand, has always been torn between those who insist that the overarching principle is love, as articulated in the Great Commandment, and those who insist it is right belief, as expressed in the “Sinner’s Prayer.” Many Evangelicals feel a non-negotiable responsibility to seek converts, as instructed in the Great Commission, which advises followers of Jesus to “make disciples of every creature.” Some perceive a God-given mandate to seize the reins of power, ruling according to biblical principles, a view called dominionism. The Bible’s contradictory prescriptions, together with differences in how Christians understand biblical authority mean that almost anything can be claimed as a religiously motivated behavior. But even if Christianity’s more than 30,000 denominations could reach consensus about how to assess the merit of religious conscience claims—which they can’t--the problem would remain. The U.S. is home to people of all faiths and none at all, each of whom has his or her own deeply held values and a constitutional right to whatever spiritual worldview he or she may hold.